OXFORD, Miss.—Phonemic awareness, sound-symbol association, and language disorders are just a few of the topics that will be discussed at this year’s Fall Institute, an event sponsored by the Communication Sciences & Disorders department (CSD) and the University of Mississippi Chapter of the National Student-Speech-Hearing Association (NSSLHA). 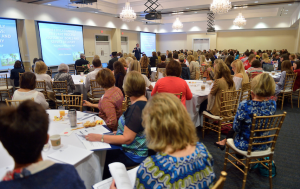 This year’s two day Fall Institute will be held on October 6th-7th, 2016 at the Inn at Ole Miss. Each year faculty, alumni, students, and professionals from across the region gather and listen to national experts give lectures on speech language pathology. Brad Crowe, co-director of CSD’s Speech and Hearing Center, said the topics for this year’s Fall Institute were selected on the importance of pre-literacy language skills that help children in school. In the past, the Fall Institute has hosted Fulbright Scholars, former presidents of the American Speech-Language-hearing Association, and other professionals in the field. This year’s speaker will be Missy Schraeder, speech language pathologist and Professional Developmental Coordinator at the DuBard School for Language Disorders at the University of Southern Mississippi. Schraeder is also an instructor for the Department of Speech and Hearing at USM. Her interest in effective therapy techniques for children with dyslexia and other speech disorders has led her to conferences all across the United States. “Missy Shraeder is a national leader on the topic of pre-literacy language skills,. That’s a major reason on why we chose her as this year’s speaker,” Crowe said. Following the Fall Institute, the UM chapter of NSSLHA will host a 5k Walk and Run. All proceeds will benefit the Wheat Voice Laboratory located in the Speech and Hearing Center within the CSD department. The lab is used for evaluation, treatment and rehabilitation of individuals with voice disorders and named after Sarah Wheat, a gifted graduate student in CSD, who passed away in 2012. The 5k Walk and Run starts at 6 PM on Thursday, October 6, near the Grove. Registration is $25.00. To register for the 2016 Fall Institute, download and fill out the registration form.